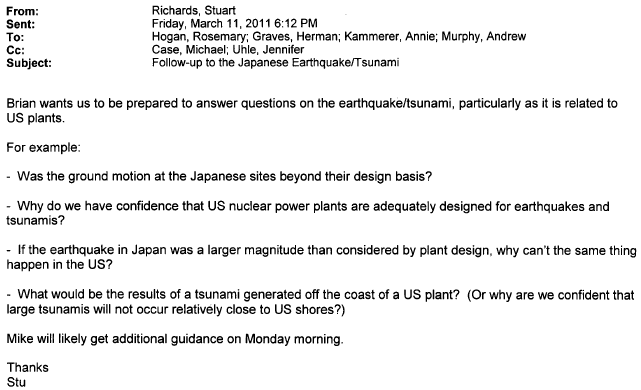 Brian wants us to be prepared to answer questions on the earthquake/tsunami, particularly as it is related to US plants. – Was the ground motion at the Japanese sites beyond their design basis? – Why do we have confidence that US nuclear power plants are adequately designed for earthquakes and tsunamis? – If the earthquake in Japan was a larger magnitude than considered by plant design, why can’t the same thing happen in the US? Mike will likely get additional guidance on Monday morning.